I know what you are thinking: “Please, not another post on cannabis.” I hear you. I really do. Over the last while, updates regarding the legalization of cannabis have saturated the news. We have also written several posts about how condos should prepare for and react to cannabis’ legalization. What I hope this post provides, is a different point of view of this topic: from the eyes of condominium residents. We have written about the reasons why we recommend that condo corporations regulate cannabis, the process of adopting a rule, and the importance of canvassing owners’ wishes when crafting such a rule. We have assisted many condos with these tasks, and in so doing, have performed numerous confidential surveys to hear from owners and tenants about what they do and do not want for a cannabis rule in their condo. I would like to address an important caveat before getting into the actual data. No two condominiums are the same. There are immeasurable factors that can differentiate one from another (like city, neighborhood, owner demographics, etc). In addition, cannabis is one of those topics where ten people in a room can hold eleven drastically different opinions between them. That all being said, we believe that the data below provides an interesting insight into what condo owners and tenants in Ontario are looking for on a practical level. You may notice that we have coloured the most cannabis-friendly responses in a nice shade of green. As you can see, the vast majority of condo residents canvassed do not anticipate smoking cannabis in their units. This data speaks for itself. 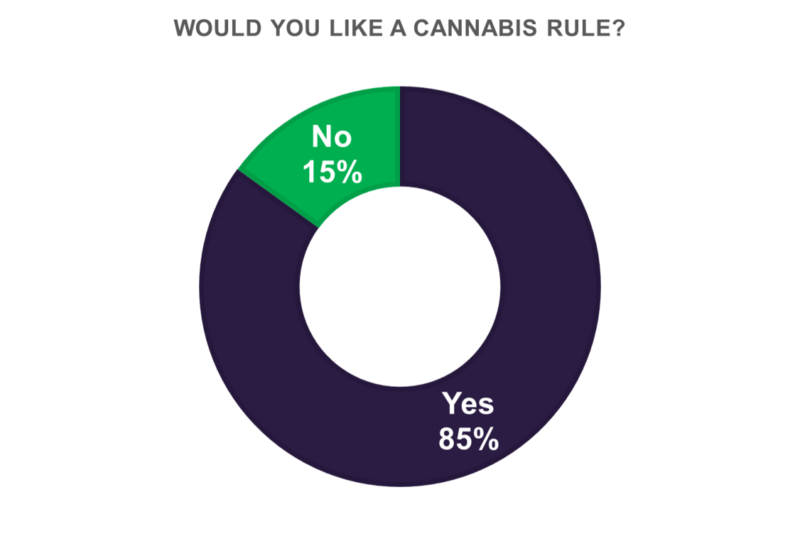 Most of the residents we have canvassed appear to want a cannabis rule. 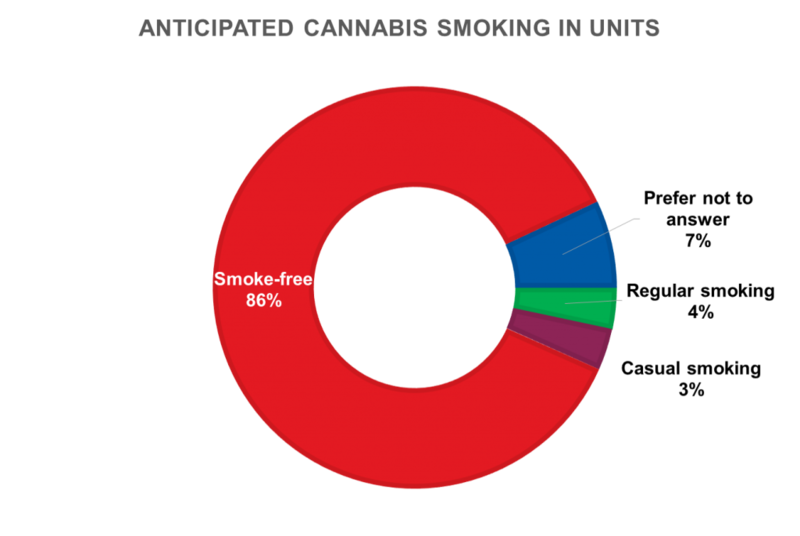 It also lines up nicely with the anticipated cannabis smoking in units. Here is where things get a bit less clear. What can we learn from this graph? Well, we can see that 92% of residents want some sort of ban. Of this group, most ask for a full ban. For the record, this typically means prohibiting cannabis smoking in the building and within 9 meters of any walls or entrances. When we see stats like this, we tend to recommend a full ban, for simplicity’s sake. However, we must remember that these answers can change from condo to condo. When we asked the same question as above, but about vaping, we received slightly different answers. 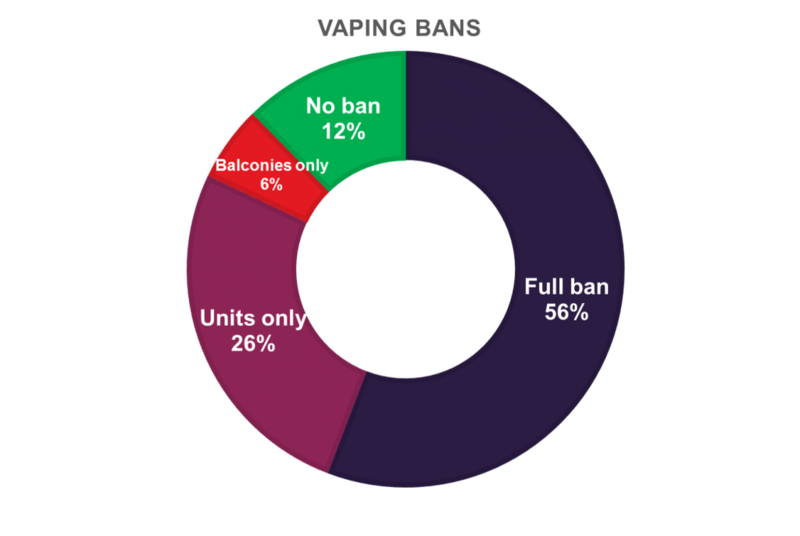 The stats are more or less the same, but there is slightly less interest in a full ban and slightly more interest in no ban on vaping. 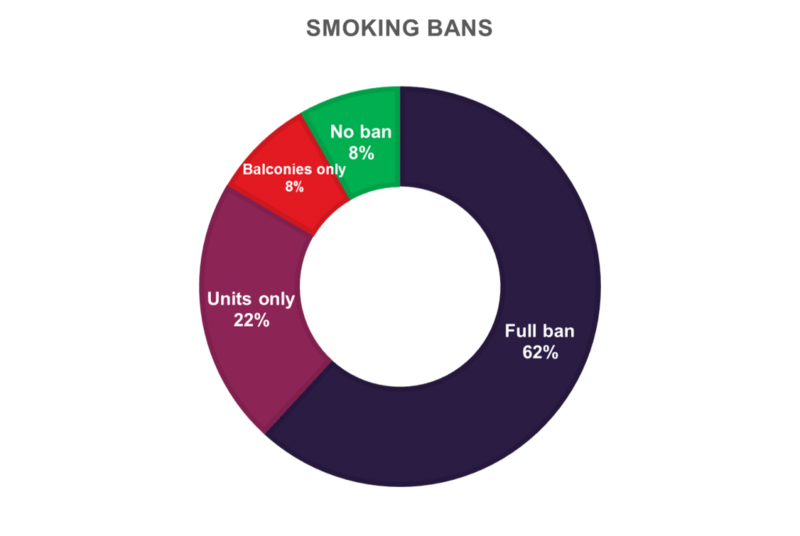 In any event, we again see that most residents are in favour of some sort of ban. This makes sense, and reflects our suggestion that in most circumstances, if you are going to regulate smoking, you should probably also include vaping. Here is another simple result. 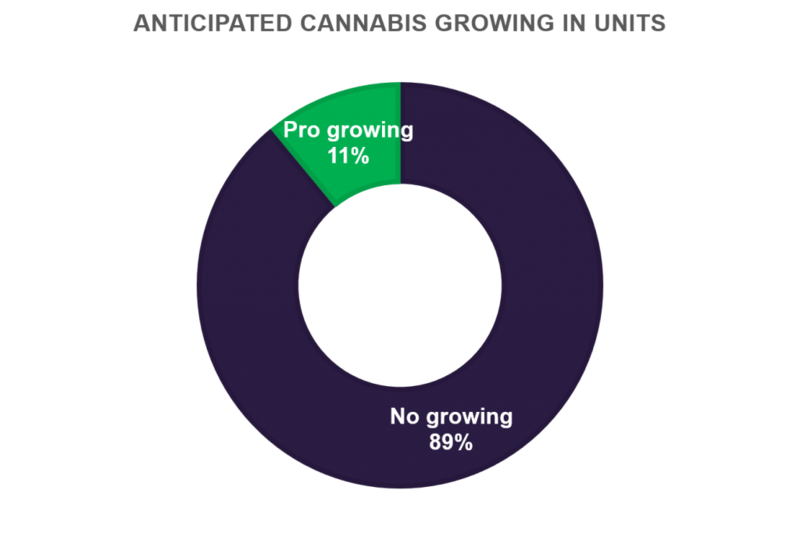 Most residents state that they do not plan on growing cannabis in their units. This lines up with what we have seen about expected cannabis use and interest in a rule. Whenever we survey condos, this question, without fail, always gives us the wonkiest results. Before getting into this too much, please note that the results you are seeing here are about tobacco smoking. I’ll also take this opportunity to state that in our view, grandfathering is not strictly necessary for a rule to be legal. You can read our blog on that here. That all being said, what are we supposed to make of these results? For one thing, I think it says something about the nature of being a neighbour. We know that the vast majority of residents tend to want some sort of smoking ban and don’t anticipate smoking in their units. You’d think this would mean that the majority would not be interested in any grandfathering. But the opposite seems to be true. 68% of residents do want a grandfathering provision. Call me sentimental, but I chock this up to neighbourly understanding and respect. Musings about human nature aside, what are we supposed to do with such a result? The graph really is all over the place. With smoking tobacco at least, although only 6% picked it, we tend to actually recommend a two year period when we see results like these. It is a good middle ground between the two extremes and allows people enough time to try and quit or reorganize their lives. 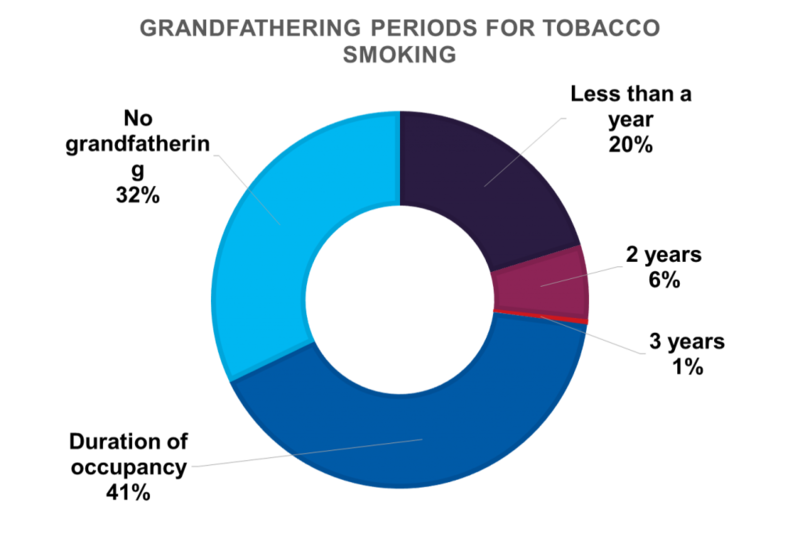 With any grandfathering period, someone will probably be unsatisfied. The key is to find the right compromise. But what about for cannabis? A grandfathering provision should only be proportional to the right being regulated. Cannabis has only be legal for a few days now. The right is not very established. As such, any grandfathering period for cannabis, at least for the next few months, need not be very long, if anything. The situation may be different if someone were to move into a building for the specific reason that it doesn’t regulate cannabis. However, in our view, the right is still very young to justify a long grandfathering period. We will have to wait and see what the future brings. If you are going to take anything away from this, let it be the importance of asking owners what they are looking for in a rule. Having the process as democratic and open as possible goes a long way for adopting a successful rule. We are always happy to help with this task.